What Are the Chances of a (Another) Metal Gear Solid Remake? 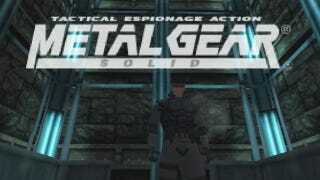 Released back in 1998, the first Metal Gear Solid is one of those titles for which gamers continuously cry "remake". Hideo Kojima, the game's creator, seems perfectly happy with the game. "Looking back, there's not anything in particular I want to go back and fix. If you change anything, you change the game—and I want to avoid that," Kojima told the Official PlayStation Magazine. "If you bring the gameplay up to modern standards, then you lose a bit of the original game. It was a game made for a certain era—not just the story, but the controls and everything about it reflect that era in which the game was made." The game recently got a re-release for the Metal Gear Solid HD Collection. "There are a lot of people wanting remakes of the original, and as producer I want to answer those calls," Kojima said. "But as a creator I'm not very interested in going back. If we were to do it, it would have to be a total remake—the only thing that would be the same would be the story. If it happened at some point I would stay as a producer, but would have to hand off most of the actual creating." Like he's done in the past. There's already been a MGS remake of sorts, Metal Gear Solid: The Twin Snakes, which was developed by Silicon Knights and featured cutscenes by Japanese movie director Ryuhei Kitamura. So when looking for Metal Gear Solid remake fodder, perhaps Kojima can remake this remake!